The first time I made this soup, my kids went crazy over it and devoured every single sip. They requested it again the very next day for lunch. Thankfully, this soup comes together in just a few minutes making it one of my go-to lunches for the kids. I’ve made this soup for a few years now and the recipe is quite versatile. It doubles nicely and the addition of an extra egg makes it a bit heartier and filling as well. I absolutely love that I can serve a cup of egg drop soup as a first course for a fancy dinner or a bowl of egg drop soup (with an extra egg) as a meal all on its own. No wonder it’s such a staple in my house. Truth be told, my middle son would probably be happy to eat Egg Drop Soup every single day. You just might want to eat it every day, too. And I wouldn’t stop you. There are so many ways to enjoy this Chinese soup that you’ll want to try them all. You can serve it as an appetizer or side dish to an Asian-inspired entrees like Chinese Vegetable Stir-Fry , Chinese Lemon Chicken or Ginger Chicken and Broccoli Stir-Fry. Pair with with Chinese Chicken Salad for an easy and nourishing lunch. My kids and I also just love to eat egg drop soup all on its own. This is one of those soups that results in complete silence at the kitchen table as everyone focuses on enjoying every last spoonful. Magic. 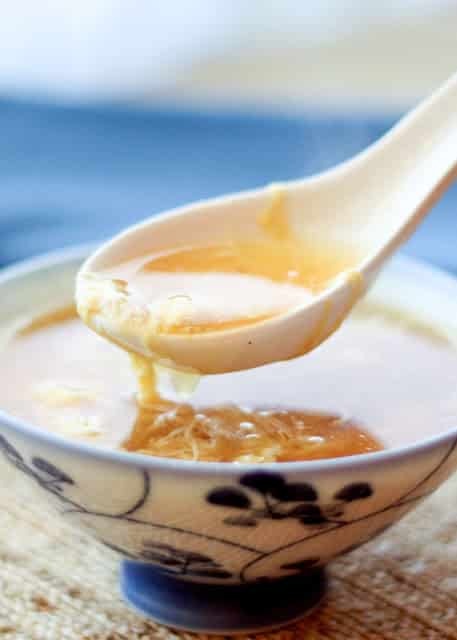 Egg drop soup is a Asian dish that’s become especially popular in American Chinese cuisine. If you’ve never tried it before, you’re in for a treat. 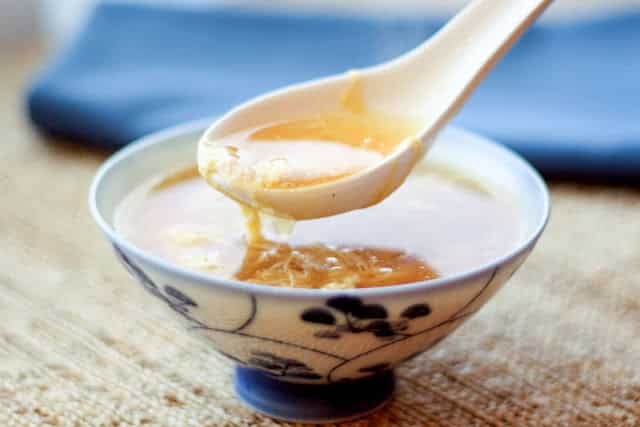 And if you’ve only had takeout versions, I think you’ll be surprised by how good and how easy homemade egg drop soup can be. We begin with boiling chicken stock or vegetable stock flavored by fresh, aromatic ginger, soy sauce and a touch of white pepper. A mixture of cornstarch and water helps thicken this brothy base. A beaten egg added at the end of cooking results in feathery whisps of cooked egged swirling through the soup. Stir the soup in one direction to evenly distribute the egg and allow it to finish cooking. This process keeps the eggy flavor and texture from overwhelming the rest of the dish. I like to garnish my egg drop soup with finely chopped green onion for a little color and extra flavor but it’s also plenty tasty without! Many restaurant egg drop soups are made with a chicken broth or chicken stock base. You can make a meat free version at home by substituting vegetable stock for chicken stock. Either one will yield a delicious result! 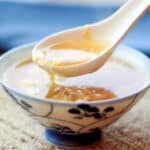 Egg drop soup is naturally wheat free, but it’s incredibly easy to make it safe for those avoiding all forms of gluten. Simply substitute regular soy sauce with your favorite gluten free soy sauce or Tamari and you’re good to go! Combine the stock, ginger and soy sauce in a large pot and bring to a boil. Reduce the heat to a simmer and add salt and pepper to taste. Whisk together the cornstarch and water and pour into the simmering soup. Stir to combine and slightly thicken the soup. Slowly pour in the beaten eggs, while stirring the soup in one direction. The egg will spread out and feather through the soup. Remove from the heat and add the green onions. Taste once more and adjust seasonings as needed. Combine the stock, ginger and soy sauce in a large pot and bring to a boil. Reduce the heat to a simmer and add salt and pepper to taste. Whisk together the cornstarch and water and pour into the simmering soup. Stir to combine and slightly thicken the soup. Slowly pour in the beaten eggs, while stirring the soup in one direction. The egg will spread out and feather through the soup. Remove from the heat and add the green onions. Taste once more and adjust seasonings as needed. Enjoy! Get wonton wraps from the produce section of the grocery store, cut into strips, and fry--done! I have never used ginger. It is only a half a teaspoon, I imagine you chop it really fine? But won't you run into a piece when eating it? Does it soften or what? Just curious. The bits of ginger don't bother me a bit, but if you're leery of them, you could ginger the ginger finely instead. How many servings dose this recipe make? 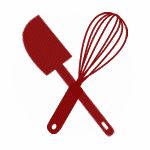 Cannot hear presentation of recipe . Why not? Very good egg drop soup.!!! I minced the ginger with a very fine grater and doubled the amount to 1 teaspoon. It was very tasty. I felt 2 tablespoons was way too much soy sauce so I used 1 tablespoon. I really like soy sauce so I was surprised that 1 tablespoon was enough. Loved this soup!!! !Adding finely chopped veggies such as carrots, spinach, or corn also is good. I just don’t add too much so it won’t disguise the wonderful flavor,I think this soup tastes better than what you get at most restaurants. Thank you so much for this recipe. I'm so happy you like the soup! Your variations sound delicious. This appears to be a good recipe for Egg Drop Soup. However, without knowing what a serving size is, and without more complete nutrition information, this recipe is virtually worthless. You tell us how many calories are in a serving, but that is totally usless! Hey Vernon, thanks for pointing out that the servings weren't listed. We usually get about 6 small (appetizer sized) bowls from this recipe. However, my boys often eat the whole recipe themselves for lunch along with sandwiches. I hope that helps!